Hello friends! If you have been following my blog or youtube videos for any length of time, you know how much I love planners. I mean it just a part of me and my personality. 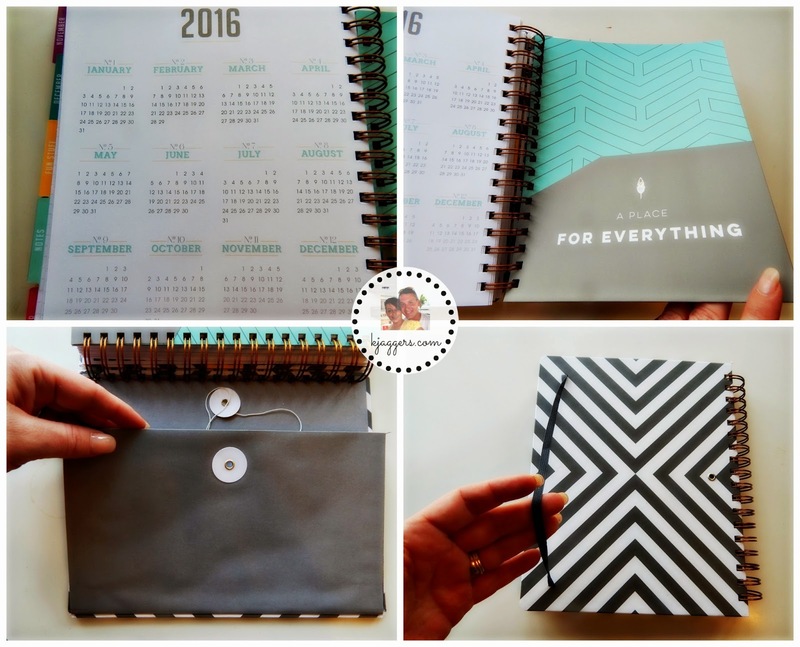 I know so many of you are interested in calendars, planners and organizers so I thought I would share some new planner reviews for 2015. I am so excited to be sharing some new planner videos through this series! 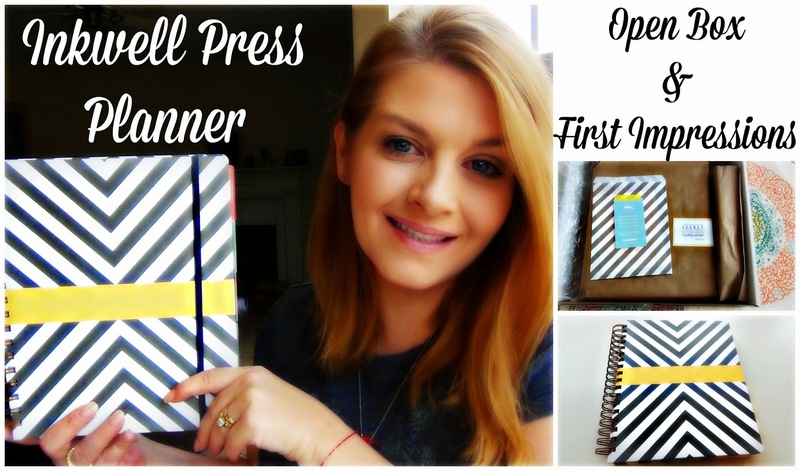 The first one we are starting with is this Inkwell Press Class Planner. This planner was not sent for me to review. This is not a sponsored post and the giveaway that corresponds with the video and post is also hosted by yours truly! Right now they are not offering personalize their planners. I think it is because they were getting so many orders which caused kinda a backup and they wanted to get them out faster to their customers. I didn't really worry about this feature. I still feel like I can personalize the one I picked out on my own if I choose. I think the total time from ordering till when it arrived at my home was 4 days! Yep!! Who doesn't love that!? Once the box arrived I was quick to get it opened. As you can see they took care in wrapping up the planner which always tells me a lot. It tells me they care about their planner, they care if it makes it to their customers undamaged and you know, presentation says a lot. So I picked out the classic Mitered Stripe planner. I thought with this design I could have a sticker or label made to personalize the yellow strip if I wanted. I love the colors of this particular planner. There are 5 different designs from the classic line that you can pick from. So the planner I picked out was the classic. The main difference is the way the weekly layout looks. The classic is laid out by hours and the flexible is more open and a easier way to plan. I like planners broke down by hours because I feel like I accomplish more when I break my days down into hours. The next 2 pages is where you can put your important dates. I honestly never found this kind of section helpful because I just put the important dates on the monthly section of the planner but I do plan on using this area for something... just not sure what that something is yet. Stay tuned! Then you have a sweet Mark Twain quote and a little extra room for notes before the monthly section begins. This area can be used for any kind of notes that you want to see at the beginning of the year. Then we move into the monthly tabs. The tabs are super secure and feel sturdy like they will hold up for a long time. At the beginning of the each new month there is a clean monthly view. I think the colors and design of this part is very grown up and sophisticated. I am also very happy with the font in the planner. It is simply beautiful. On the right side of the monthly layout is a big area that is not lined for any additional monthly notes or doodles. Right on the other side is a notes page that carries over from the mission board for notes and more ramblings. Its more room for all the notes you made on the other side. I think this area is pure genius. On the other side of the note page, your weekly view starts. It's a two page vertical design where day has a column. The column is broke down by hourly time slots that start at 8am and end at 7pm. The bottom half of the calendar is broke down into 3 sections. The top section is for meals, the middle for home, and the bottom is for fitness. So to be very honest I will not completlyy use the bottom as intended. I will use the meals area for our dinner but the home section I am going to use for things to do in the evening or things regarding the house and the bottom will be for online activity such as blog and youtube content, etc. I still have another planner for my blog and youtube but I also like to see it in this area because this will be the most used planner of the bunch. And it will be handy to know the schedule each week. On the right side you have a lined note area the length of the page. You could put any additional notes or list that will help you get through your week in this area. Each month is broke down into different simple but beautiful colors. I think the colors are soft and again the font on these pages looks amazing. 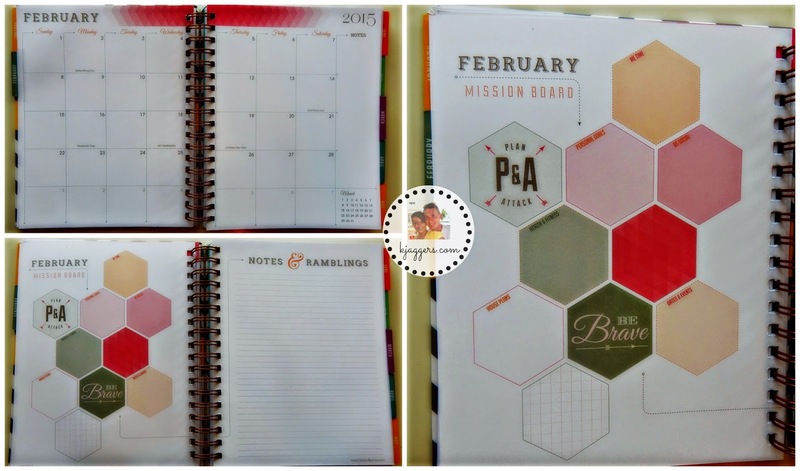 This is a 12 month planner so this layout is the same through all the months with the exception of the colors. At the back of the planner there is a tab for fun stuff. This is a super neat area that gives you a few tools to help make life easier. The first two pages include a Go Anywhere page that gives you an area to record travel information such as flight info, a driving log, hotel accommodations, and a to do list that is sure to help you plan any trip. 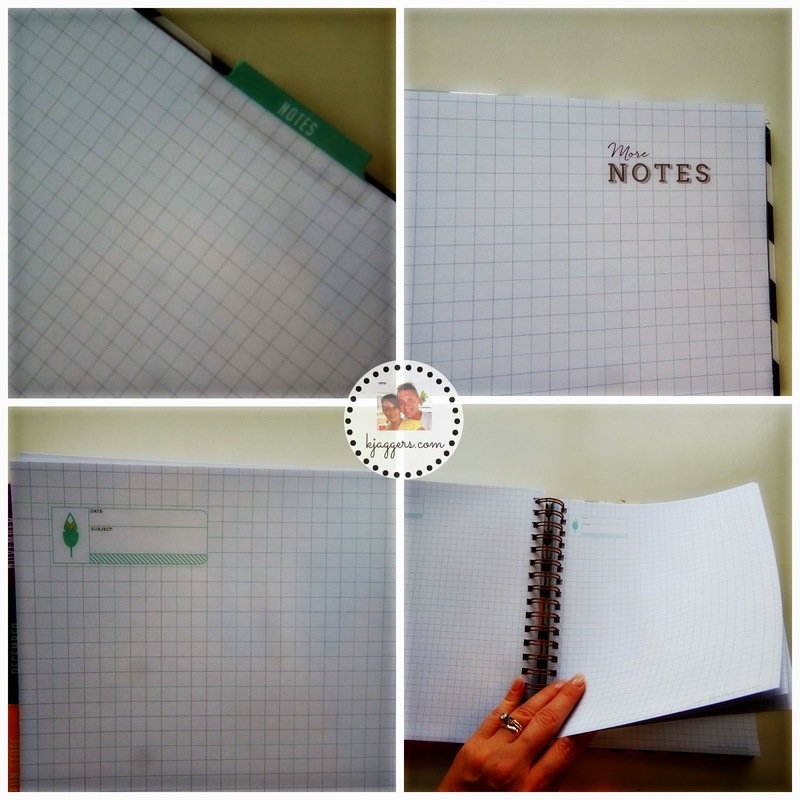 There are 3 of these sections which might not be enough for me so I might remove the full page ( yes, it is possible ) and copy it...and make more to add to the planner. The next two pages give you a Gift List area that you can make out for people you need to shop for. It also has a big empty box titled " Ideas for me " where you can put some gifts you might want to ask for or buy yourself. On the back of the Guest List page is a Movie and Books area. This is also interesting. It gives you a Family Favorites, Date night, Guilty Pleasures and Artsy movie categories. I love this because you can put movie ideas down in different categories. I totally think I use this area. The bottom part of the same page is a book area. It has Best Sellers, Just for me, Classics, & Motivational sections of books you want to read through out the year. Again, I think this is an area that I will use. The next tab is the Note section. This area is nicely designed and at the top of the page there is a date and subject label for easy organization. This area is all graph paper which I also love. You get 11 pages of paper for notes throughout the year. The back of the planner consists of a 2016 at a glance calendar for future planning, a thick double sided pocked folder that is a beautiful green and taupe. Clearly you can store any additional papers in this area. On the back wall of the planner there is a really nice classy pocket folder than can hold anything you need it to. I think this is a very neat idea and I can't wait to see how well it holds up. On the back of the planner, you can see the elastic band that secures around the planner. I like that this is built in so it can't be lost. So over all, I think this is a wonderful planner packed full of ways to brainstorm, plan and organize your day to day life. I really really like it. One thing I forgot to mention is there are free printables that you can print out and insert into the planner. When I come back and show you how I am using this planner in a couple months, I will be sure to explain how you can put more pages in. Really it's a simple as a little cutting and hole punching. It doesn't get easier than that! So lets get on with the giveaway. Since I love to share things I love with you, I am hosting a giveaway so one of you will be get one to try out yourself! This Inkwell Planner Giveaway will run from today February 6, 2015 until Saturday March 7, 2015. The giveaway is open internationally. All entrants under the age of 18 must have parental permission to enter. The one winner will win a Inkwell Planner in your pick of Classic or Flexible in any design that you want.